I imagine there are a few politicians out there in the U.S. right now who can identify with my current situation of eating crow. But honesty is the best policy and confession is good for the soul, right? I’ve been excited about this one for weeks, that is ever since I discovered it (I haven’t stopped baking beautiful bread since that day). …I might have judged her. Who could really bake bread non-stop? I mean, bread takes forever! You gotta proof the yeast, let it rise, punch it down, knead it, let it rest…. No one could keep up with that on a regular basis. I should know. I may have won first prize at the county fair for my homemade bread one year around the 8th grade. Not to brag, but I moved on to compete at the state fair. It was that good. And it took practice and time and talent. Baking bread isn’t like baking cookies or brownies from a box. Which is probably why homemade bread is my favorite food. I love it even more than dark chocolate, and I don’t make those comparisons lightly! Homemade bread comes with the understanding that someone slaved in a hot kitchen for hours to produce something light and chewy and delicious. So certainly no one could sustain doing that non-stop for weeks! That’s crazy! And then I tried the recipe. It took me awhile to get to it. I waited until I had a day off work when I could be home all day. I figured I would work on some school work while the bread rose each time and then while it was in the oven. And then I read the recipe a little closer. Once the dough is well mixed, cover the bowl with plastic wrap and leave to proof on the kitchen counter for anywhere from 12 – 20 hours. What?? I had to let it sit for 12-20 hours? This meant no bread today. Humph. I was initially very grumpy because I wanted bread now. What was going to distract me from working on school work now? (Don’t worry, I found something.) I had already convinced myself that I was making bread, and my stubborn streak kicked in, so I mixed it up according to the directions. I managed to dig out all four ingredients. That’s right–4. Flour, yeast, salt, and water. This is the only bread recipe I have ever memorized. I can’t even remember the proper name of my prize-winning bread recipe from the county fair, much less how to make it! But this one is so simple. 1. Whisk the first three ingredients, then mix in the water. Let it sit for 12-20 hours, covered with plastic wrap. 2. When you are ready to bake, preheat the oven to 450°. Then preheat a casserole dish in the oven for 30 minutes. Make sure it’s one that has a lid or that you can put foil over tightly. 3. While the dish is preheating, take the dough out of the bowl and dump it onto a floured surface. Shape it into a loaf. Remove the dish from the oven, put the bread in the dish, the lid on the dish, and the dish in the oven for 35 minutes. Remove from the oven and let the bread cool on a wire rack. You’ve almost memorized it, too, haven’t you? Even my husband has the baking instructions down pat after baking a loaf for me over the weekend. I’m so convinced that the recipe is fool proof, that I intend to have the husband make an entire loaf from start to finish without me. For the first loaf I made I used all white flour, and I added about a teaspoon each of sage, rosemary, and thyme. The second one was 1 part wheat and two parts white flower with the same herbs plus a little fresh parsley from the CSA (inspired by Simon and Garfunkel). 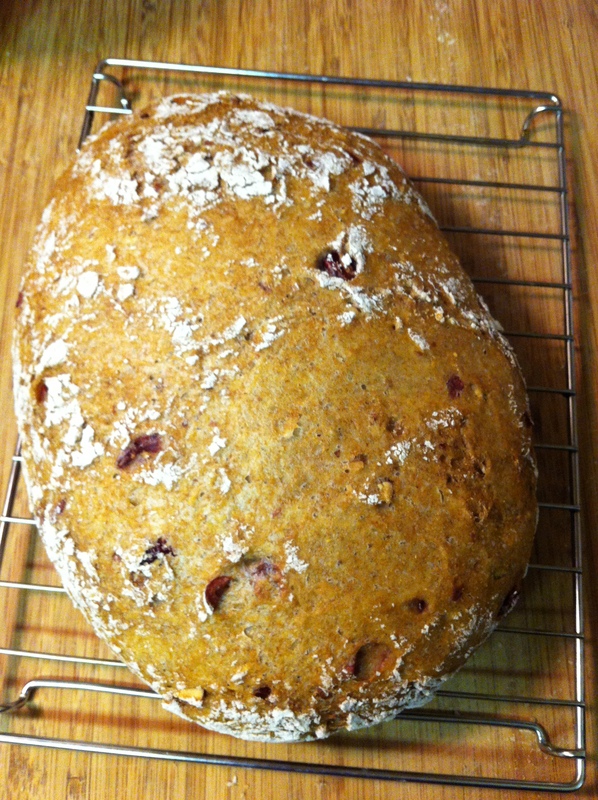 The third loaf is one part wheat and one part white flour with dried cranberries, finely chopped almonds, and a little ginger added. That’s right, I’ve made 3 loaves in just over a week. I drank the Kool Aid and joined the club. I’m eating crow for secretly judging Shira for making this bread non-stop. And I open myself up to your judgment until you try the recipe and have a similar moment. I could seriously make this bread every day. Since I get up so early before work to workout (okay, I intend to workout), shower, and get ready, I can actually bake this bread and have it out of the oven in time for breakfast. It’s so convenient it’s scary, and I’m going to have to actually start working out in the morning to make up for the loaves starting to grow on my backside. I encourage you to seriously consider using this bread for every holiday meal this season. Just think, you mix it up the night before and pop it in the oven in the morning and turn out a couple of perfect loaves of obviously homemade bread. I think I can wow some in-laws with this one! Christmas gifts? I leave you with just one photo of my most recent loaf and insist that you go look at the rest of the mouth watering photos over at In Pursuit of More. My camera phone shots can’t hold a candle to her masterpieces. And then go mix up this bread so you can have some tomorrow! Update February 2014: I am now making this bread religiously. I haven’t bought bread from the store in months and the husband is spoiled rotten with homemade bread. My sister has joined the bandwagon, too, and makes this recipe for her husband and two kids. My current favorite mixture is half wheat and half white flour, add 1 tsp sugar and 1/4 tsp ground black pepper. Update January 2019: This is still THE bread recipe for our household! The crusty is soft enough that the 4 year old can bite through it. And since it’s a very simple recipe, it works for our FPIES daughter, too. Previous Post Previous post: Today is an important day–it’s my birthday! Next Post Next post: Can dairy-free lasagna happen (and be good)? I’m so jealous! I have had some versions rise more than others. I think using plastic wrap (as instructed) instead of a towel helps. I’m glad he’s willing to try, try again!